Finnair (Helsinki) on May 11 will open a new daily service to Gdansk, Poland. The service will be sold with Finnair’s flight number, and it will be operated by Flybe Finland (Helsinki) with ATR 72 aircraft. In addition to Gdansk, in Poland, Finnair flies daily to Warsaw year-round and to Krakow from April 2 until October 22, 2015. Copyright Photo: Ton Jochems/AirlinersGallery.com. ATR 72-212A (ATR 72-500) OH-ATG (msn 757) sits on the Helsinki (HEL) ramp. This entry was posted in Finnair, Flybe Finland and tagged 757, Albatros Airlines, ATR, ATR 72, atr 72 aircraft, ATR 72-212A, ATR 72-500, Finnair, Flybe Finland, Gdansk, Gdansk Poland, HEL, Helsinki, OH-ATG, Poland on March 10, 2015 by Bruce Drum. Island Air (Honolulu) closed the sale of the airline today to a newly formed holding company owned by Lawrence J. Ellison. The sale secures the future of Island Air and its employees. “We are excited Mr. Ellison has acquired Island Air. He has the vision and resources to literally take Island Air to new heights,” said Les Murashige, Island Air president. Island Air has already added one new ATR 72 aircraft to its fleet (above). 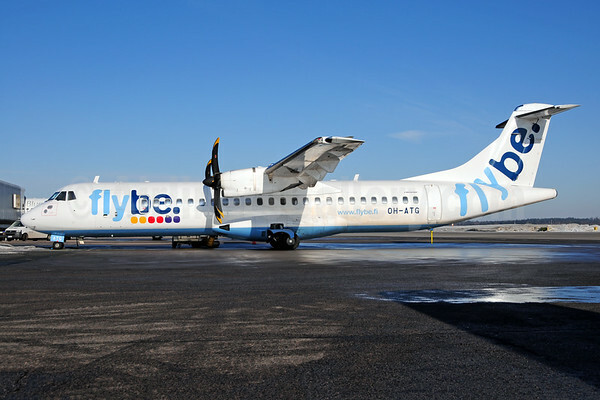 There are no planned staff changes and Island Air will continue its operations as usual while developing plans for additional planes, routes and services. All current tickets will be honored and all Cloud9 members will retain their status and benefits. According to Wikipedia, co-founder and chief executive of Oracle Corporation, one of the world’s leading enterprise software companies. As of 2012, he was the third-wealthiest American citizen, with an estimated worth of $41 billion. The bulk of Ellison’s fortune comes from his 22.5 percent stake in Oracle. 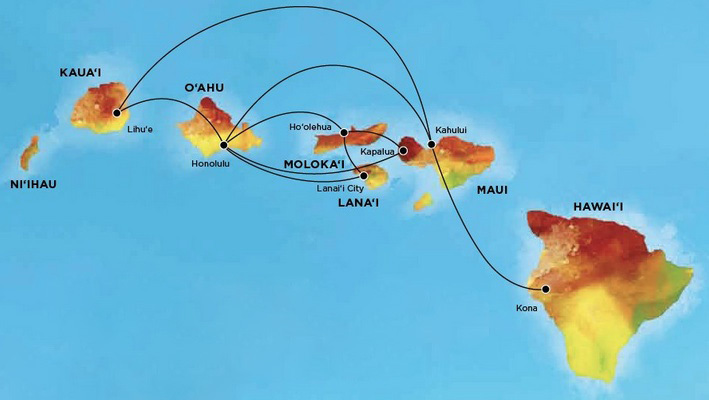 Larry Ellison purchased the island of Lāna‘i (LNY), so this airline purchase ensures that tourists will have access to the island. Hawaiian may have the ATR 42, but with the larger ATR 72, Island Air can bring more passengers to LNY. Top Copyright Photo: Island Air. The first ATR, ex-American Eagle ATR 72-212 N348AE (msn 349) has become N941WP. Bottom Copyright Photo: Ivan K. Nishimura. 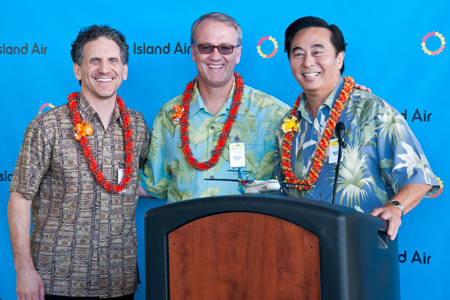 (L-R) Paul Marinelli, VP Lawrence Investments; Michael Rodynuck, Senior Consultant; Les Murashige, Island Air CEO. This entry was posted in Island Air (Hawaii) and tagged atr 72 aircraft, aviation, Island Air (Hawaii), transportation on February 27, 2013 by Bruce Drum.